Fatourehchi, Ehsan Mohammadpour, Mahdi Theodossiades, Stephanos and Rahnejat, Homer 2019. Transient thermal analysis of mixed-elastohydrodynamic contact of high performance transmission in a dry sump environment. Proceedings of the Institution of Mechanical Engineers, Part J: Journal of Engineering Tribology, Vol. 233, Issue. 2, p. 326. Huai, Chongfei and Zhao, Yaping 2019. Variable height modification of TA worm drive. Proceedings of the Institution of Mechanical Engineers, Part C: Journal of Mechanical Engineering Science, Vol. 233, Issue. 1, p. 227. Hsu, Ruei-Hung Wu, Yu-Ren and Tran, Van-The 2019. Manufacturing helical gears with double-crowning and twist-free tooth flanks using a variable pressure angle shaving cutter. Proceedings of the Institution of Mechanical Engineers, Part B: Journal of Engineering Manufacture, Vol. 233, Issue. 1, p. 77. Zhao, Yaping and Sun, Xiaodong 2019. EuCoMeS 2018. Vol. 59, Issue. , p. 292. Yang, Jian Sun, Fang-Hong and Lu, Zheng 2019. Solving the screw compressor rotor-forming grinding wheel using the edge detection method based on the graphic method. Proceedings of the Institution of Mechanical Engineers, Part E: Journal of Process Mechanical Engineering, p. 095440891881828. Feng, Guangshuo Xie, Zhifeng and Zhou, Ming 2019. Geometric design and analysis of face-gear drive with involute helical pinion. Mechanism and Machine Theory, Vol. 134, Issue. , p. 169. Brecher, Christian and Weck, Manfred 2019. Werkzeugmaschinen Fertigungssysteme 1. p. 271. Cazan, S and Creţu, S 2018. Tooth contact analysis of spur and helical gears with end relief profiles. IOP Conference Series: Materials Science and Engineering, Vol. 444, Issue. , p. 022004. Peng, Qianlei Gui, Liangjin and Fan, Zijie 2018. Numerical and experimental investigation of splashing oil flow in a hypoid gearbox. Engineering Applications of Computational Fluid Mechanics, Vol. 12, Issue. 1, p. 324. Politis, Denis J Politis, Nicholas J Lin, Jianguo Dean, Trevor A and Balint, Daniel S 2018. An analysis of the tooth stress distribution of forged bi-metallic gears. Proceedings of the Institution of Mechanical Engineers, Part C: Journal of Mechanical Engineering Science, Vol. 232, Issue. 1, p. 124. Marciniec, Adam Pacana, Jacek Pisula, Jadwiga Malgorzata and Fudali, Pawel 2018. Comparative analysis of numerical methods for the determination of contact pattern of spiral bevel gears. Aircraft Engineering and Aerospace Technology, Vol. 90, Issue. 2, p. 359. Sun, Qiang and Sun, Yuehai 2018. The generation principle, mathematical models of variable involute, and its application. Proceedings of the Institution of Mechanical Engineers, Part C: Journal of Mechanical Engineering Science, Vol. 232, Issue. 5, p. 828. Lyashkov, A A 2018. Geometrical and computer modeling of the technical workpieces main objects shaping. Journal of Physics: Conference Series, Vol. 1050, Issue. , p. 012048. Lu, Yang Kovacevic, Ahmed and Read, Matthew 2018. Numerical study on screw machines with large helix angles. IOP Conference Series: Materials Science and Engineering, Vol. 425, Issue. , p. 012023. Vosniakos, George-Christopher Kalattas, Alexandros and Siasos, Alexandros 2018. Optimal process planning for helical bevel gears using Taguchi design of simulated machining experiments. Proceedings of the Institution of Mechanical Engineers, Part B: Journal of Engineering Manufacture, Vol. 232, Issue. 14, p. 2627. Chen, Zhen and Zeng, Ming 2018. Nonrelative sliding of spiral bevel gear mechanism based on active design of meshing line. Proceedings of the Institution of Mechanical Engineers, Part C: Journal of Mechanical Engineering Science, p. 095440621876746. Lagutin, S. Sandler, A. and Gudov, E. 2018. Advanced Gear Engineering. Vol. 51, Issue. , p. 139. HAMADA, Shigenori KAWASAKI, Kazumasa and TSUJI, Isamu 2018. Tooth contact analysis and manufacturing of dual lead worm gears in ISO type I. Journal of Advanced Mechanical Design, Systems, and Manufacturing, Vol. 12, Issue. 1, p. JAMDSM0026. Tan, Rulong Peng, Changyan and Chen, Bingkui 2018. Investigation on the semi-conjugate tooth model and disc milling process of logarithmic spiral bevel gears of pure-rolling contact. Journal of Mechanical Science and Technology, Vol. 32, Issue. 10, p. 4829. This revised, expanded, edition covers the theory, design, geometry and manufacture of all types of gears and gear drives. This is an invaluable reference for designers, theoreticians, students, and manufacturers. 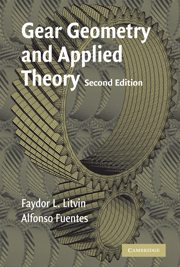 This edition includes advances in gear theory, gear manufacturing, and computer simulation. Among the new topics are: 1. New geometry for modified spur and helical gears, face-gear drives, and cycloidal pumps. 2. New design approaches for one stage planetary gear trains and spiral bevel gear drives. 3. An enhanced approach for stress analysis of gear drives with FEM. 4. New methods of grinding face gear drives, generating double crowned pinions, and improved helical gear shaving. 5. Broad application of simulation of meshing and TCA. 6. New theories on the simulation of meshing for multi-body systems, detection of cases wherein the contact line on generating surfaces may have its own envelope, and detection and avoidance of singularities of generated surfaces.